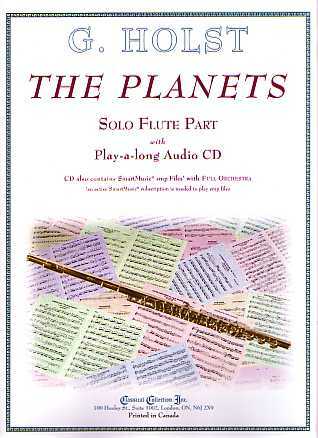 The Planets is presented as a Solo for Flute, Bb Clarinet or Alto Saxophone with a play-a-long Audio CD which also contains SmartMusic SMP Files. 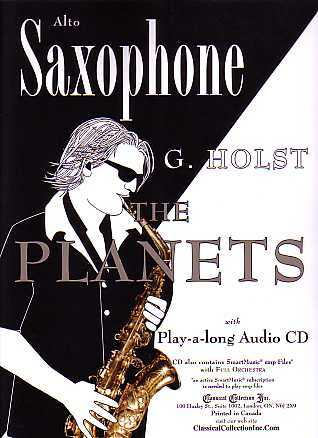 Each of the seven movements (Planets) follows Holst’s original score, so that any standard recording of the work can also be used for play-a-long. 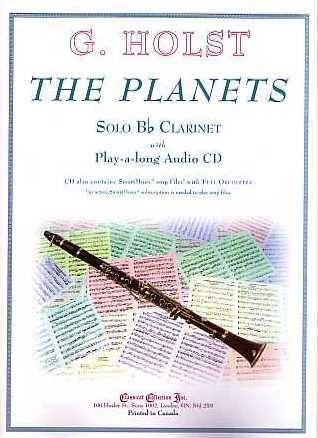 This edition of The Planets is ideal for anyone who is studying or listening, to better understand and, in general, enjoy the wonderful music of this outstanding piece! Duets Books are also available. Gustav Holst, composer, pianist and trombonist, was born on September 21, 1874 in Cheltenham, England and died on may 25, 1934 in London, England. Although his most famous work is The Planets, Op. 32 (1914-6), Holst composed a wide variety of works: more than 10 operas - 4 published: Savitri (Op. 25, 1908), The Perfect Fool (Op. 39, 1918-22), At The Boar’s Head (Op. 42, 1924) and The Wandering Scholar (Op. 50, 1929-30); several works for chorus and orchestra, including Hymn To Jesus (Op. 37, 1917) and Choral Symphony (Op. 41, 1923-4); many orchestral works, including A Somerset Rhapsody (Op. 21, No. 2, 1906-7), St. Paul’s Suite (Op. 29, No. 2, 1912-3), Egdon Heath (Op. 47, 1927), Double Violin Concerto (Op. 49, 1929) and Brook Green Suite (1933); a very large number of choral works; and works for band, including 1st Suite for Military Band (Op. 28, No. 1, 1909), 2nd Suite for Military Band (Op. 28, No. 2, 1911), A Mooreside Suite (for brass band, 1928) and Hammersmith (Op. 52, for military band, 1930). The Planets consists of 7 movements (Planets) with subtitles based on the astrological, rather than astronomical, nature of each planet. 1. Mars, The Bringer of War uses three themes (the first beginning in bar 3, the second beginning in bar 43 and the third beginning in bar 68); but without doubt, the most distinctive aspects are the 5/4 meter and ostenato (repeated figure) in the Timpani, Harps & Strings which begins the work. 2. Venus, The Bringer of Peace has only one theme (beginning in bar 32) along with two motifs (short figures: the first beginning in bar 1 with the Horn and the second beginning in bar 3 with the Woodwinds). 3. Mercury, The Winged Messenger contains four themes (the first beginning in bar 1 in the Woodwinds, the second beginning in bar 47, also in the Woodwinds, the third beginning in bar 83 in the Violin and the forth beginning in bar 189 in the Strings). The opening theme uses the tritone (literally 3 tones Concert Bb to E), juxtaposing the arpeggio or first 4 notes of the major scale of Bb in the first half of the bar to E in the second half (see bars 26-7). The third theme is an 8 bar ostenato (repeated theme). 4. Jupiter, The Bringer of Jollity ,the largest movement (and planet), also uses four themes, all introduced featuring Horn (the first beginning in bar 6, the second beginning in bar 65, the third beginning in bar 108 and the forth beginning in bar 193). Also, like Mercury, the third theme is an 8 bar ostenato (repeated theme). In 1921 Holst set the final theme to the words of the poem I Vow To Thee, My Country by Cecil Spring-Rice (1859-1918). 5. Saturn, The Bringer of Old Age uses three themes (the first beginning in bar 4, the second beginning in bar 30 and the third beginning in bar 53). Each theme also uses background ostenatos (repeated figures). A notable feature of Saturn is the deliberate obscuring of the metric rhythm (the feeling of the time signature) beginning at bar 77. 6. Uranus, The Magician uses four themes (the first beginning in bar 9, the second beginning in bar 46, the third beginning in bar 72 and the forth beginning in bar 138) along with a four note motif which opens the work and appears throughout to maintain unity. Much of the work uses the whole tone scale as basis for construction and it is very likely that Holst based Uranus entirely upon Saturn: both were written the same year, the opening motif in Uranus uses the same notes as the opening background ostenato in the Flutes in Saturn, etc., etc. 7. Neptune, The Mystic uses three themes (the first beginning in bar 1, the second beginning in bar 22 and the third beginning in bar 58) - the second “theme” is really an harmonic technique. Similar to the first theme in Mercury, the first theme juxtaposes two different arpeggios (Concert E minor & G# minor), while the second “theme” uses them simultaneously as chords (Concert E minor above C# minor - bar 22 and start of 23, then Concert G# minor above E minor - end of bar 23).